The Acumatica Financial Management Suite Accounts Payable (AP) module is used to track vendor invoices, automate payment processing, predict cash requirements, track vendor balances, manage available discounts, and deliver vendor reports. The AP module is integrated with all other Acumatica modules and can be deployed on premise or hosted at a datacenter so you can control where sensitive data is stored. Access 100% of your accounts payable features from anywhere using any popular web-browser. Avoid late charges and take advantage of vendor discounts by aligning payments with cash flows. Run reports to determine upcoming cash requirements and manage payments accordingly. Enter data more quickly with predictive entry and flexible screen layouts. 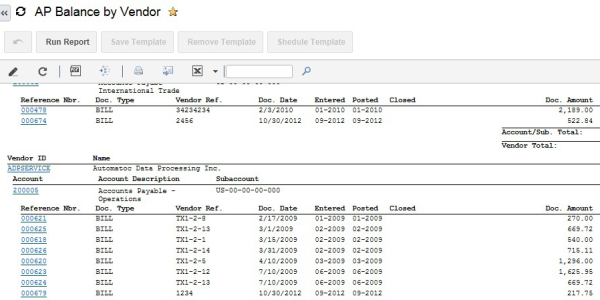 Reduce errors by setting default accounts, subaccounts, payment terms, and discounts by vendor. Improve vendor payment decisions by using drill down reports and dashboards to gain access to past information and provide insights into future needs. Maintain vendor balances in both a base currency as well as the vendor currency. Currency translations are performed automatically.